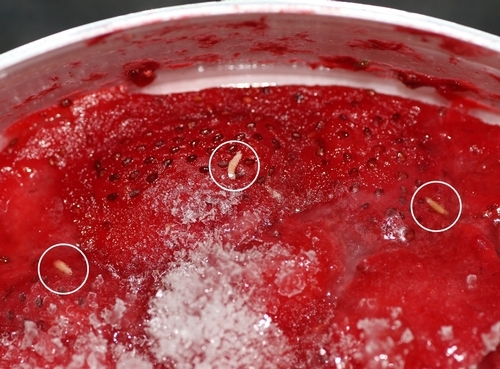 Spotted wing drosophila (SWD), Drosophila suzukii has become a potential concern for strawberries following its damage to cherries, blackberries, raspberries, and blueberries in coastal California. Other species of Drosophila are morphologically not equipped to attack ripening strawberries. Their ovipositors or egg laying parts are not strong enough to penetrate unripe or ripening berries. They may damage overripe strawberries left on the crop, but since such berries are not marketed, they have not been an issue for growers. However, SWD has a heavily sclerotized, serrated ovipositor that enables it to lay eggs in fruits that are not fully ripe. Hard and dark (sclerotized) ovipositor with prominent serrations or saw-teeth that enable the fly to lay eggs in intact ripening fruit. Normal ovipositor of a Drosophila sp. (left) compared to the heavily sclerotized and serrated ovipositor of spotted wing drosophila (right). According to Dr. Brian Cabrera, Santa Barbara County Ag Commissioner Entomologist, there haven't been any SWD infestations that were brought to his attention. So, it appears to be the first report of SWD in Santa Maria strawberries. Sanitation, trapping, and chemical control are among the available options to manage SWD. Close monitoring is necessary in vulnerable areas. More details about identifying and managing SWD can be found in the listed references. Here is a brief note about this pest. SWD belongs to the group of flies that are generally known as vinegar flies or lesser fruit flies. It was initially known as cherry fruit fly in 1930s and is now referred to as spotted wing drosophila. Origin and distribution: It is traditionally known to be a pest in Asia, but it is now reported in Neo Tropics, North America, and Europe. In the US, it has been found in Hawaii, Washington, Oregon, California, and Florida. Host range: They generally infest thin-skinned fruit and prefer temperate climate. Host range includes apple, blackberry, blueberry, cherry, dogwood, grape, mulberry, peach, persimmons, plum, raspberry, and strawberry. Biology: SWD prefer 68-86 oF and overwinter as adults. Various sources suggested 5-10 generations per year. According to Kanzawa (1939) egg laying starts in spring and can last for 10-59 days. Females lay an average of 384 eggs at 7-16 per day. Eggs hatch in 2-72 hours and larval stage lasts for 3-13 days. Pupation takes place inside the fruit or in the soil and lasts for 3-15 days. Life cycle takes anywhere from 21-25 days at 59 oF to 7 days at 82 oF. Calabria G., J. Máca, G. Bächli, L. Serra and M. Pascual. 2012. 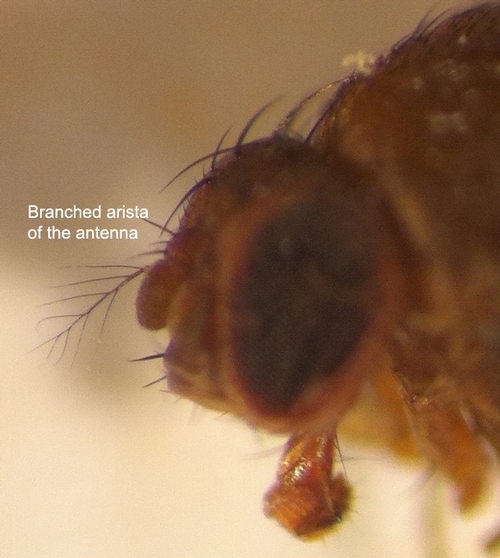 First records of the potential pest species Drosophila suzukii (Diptera: Drosophilidae) in Europe. J. Appl. Entomol. 136:139-147.